Recipes change with time and repeated preparations. So when the usual crew showed up to to be fed this weekend I made a conscious effort to pay attention to what I was doing and the quantities while making this dish. Sure enough, quite a few things were different from the original recipe. The changes are in bold. The original recipe is in the cookbook mentioned below. But you don’t want the original recipe. You want this one. Saute onions in butter, add flour then broth. Cook over medium heat until thickened. Add chiles and sour cream and heat. Be careful to not let the sauce boil. Set aside. 1. Butter a 9 x 12 casserole dish. 2. Put a little sauce in the bottom of the dish. 3. Layer 3 corn tortillas. Layer chicken. Cover with jack cheese. Sauce. Repeat two more times. 4. Bake 350 degrees for 20-25 minutes covered until bubbly. Remove cover, add cheddar cheese to the top. Return to the oven to allow cheese to melt. 5. After cheese has melted, remove from the oven and allow to sit for 10-15 minutes before serving. And yet another recipe whose origin is kind of fuzzy. I think this recipe kind of morphed from Delicioso! Cooking South Texas Style. But when I go to the book, the recipe is different, calling for Monterrey jack cheese and jalapenos. If this is the source of the recipe, then somewhere along the Path I subbed mild chiles and cheddar. But pretty much the recipe is from this classic cookbook. Tips – Cut up the chicken first. If you use pre-shredded cheese make sure it the kind that will melt (if you know what I mean and I think you do). Use more sour cream if you like a rich casserole. Use more chicken stock if you like your casserole “juicy” as in fall apart and spread all over your plate “juicy”. Go ahead and use the hot pepper of your choice if you don’t have kids. Mix the above ingredients together to make the dressing. And another simple supper recipe is born. I like to cook. But let’s be honest, cooking is work. During my exploratory twenties, I seriously entertained the idea of becoming a professional chef. I researched the topic extensively. My sights were set on the CIA (Culinary Institute of America). But the more I learned about the profession the more I realized that I wanted cooking to remain fun. So I let that dream die. Joe was a good business manager and a better motivator. I seem to recall he didn’t fix another meal the rest of the time we lived together. Just another one of those things that make you go hmm…. But I didn’t mind because I like to cook. And one of the things I learned was there is nothing wrong with shortcuts. One of the greatest time savers for the cook is the rotisserie chicken. It’s already cooked and the perfect starting point for many dishes. I’m not quite sure I have 50 recipes that use rotisserie chicken but it sure will be a lot of fun getting there. Check ’em out. PS. Yes, there’s just 3 recipes in the series…for now. Heat 1 tablespoon of the olive oil in a medium saute pan over medium heat and add the peppers, onions and garlic. Saute until just soft, remove to a plate and cool. When the peppers and onions are cool, combine all of the remaining ingredients together. Form the meat mixture into 2 loaf (brain) shapes on an oiled oven tray or baking dish. When the kids were little I never made meatloaf. They hated meatloaf. When I was growing up as a kid my parents never made meatloaf. I hated meatloaf. Time passes, people change, tastes change. I guess decades of going meatloaf-less made me want meatloaf more. I only started making meatloaf when MedFed began. MedFed is the code name for meals that freeze well that can be defrosted, heated up, and eaten by time starved medical school students who would quite frankly probably eat anything you put in front of them. The only problem with my new found meatloaf craving was finding the perfect recipe. This recipe is adapted from the Food Network’s Michael Chiarello. It’s tasty, simple, and hearty. Serve this up with some loaded mashed potatoes and a green vegetable. TIP – The recipe will make two meatloaves. There’s nothing better than a cold meatloaf sandwich the next day. I’ve also heard rumors that you can chop up this leftover meatloaf, heat it up in some marinara sauce, and serve over pasta. Sounds like something a medical school student would do. Substituting dried for fresh herbs is OK. I usually make this with a mixture of beef and turkey. 85/15 is good. Don’t use ground turkey breast, use regular ground turkey. 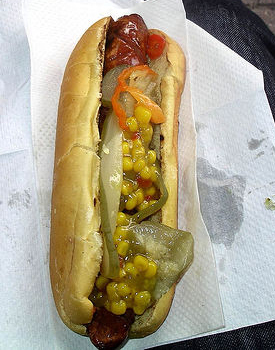 Toronto is home to some of the best hot dog street vendors in the world. Street meat, we call it proudly, waiting in lines to get char-grilled, crisp-on-the-outside, soft-on-the-inside, big, brown beautiful hot dogs. The dogs usually come set perfectly in a puffy, yellow bun, like a smiling child tucked tightly into bed. Yes, it’s a glowing little beef-tube of heaven, a spicy little meat-wand of joy, the perfect company for a movie or a long walk home after the bars. Carve the chicken off the bones. Set aside. Open one bag of salad into a large serving bowl. Add sliced tomatoes, cucumbers, carrots, etc. Arrange the chicken on top. Serve with your favorite bottled salad dressing. Every grocery store now sells Rotisserie Chickens. It’s cooked. All you have to do is cut it up. Bagged salads are the greatest food invention since sliced bread. You should always have several different varieties of salad dressing in the house. Add a few chopped fresh vegetables. 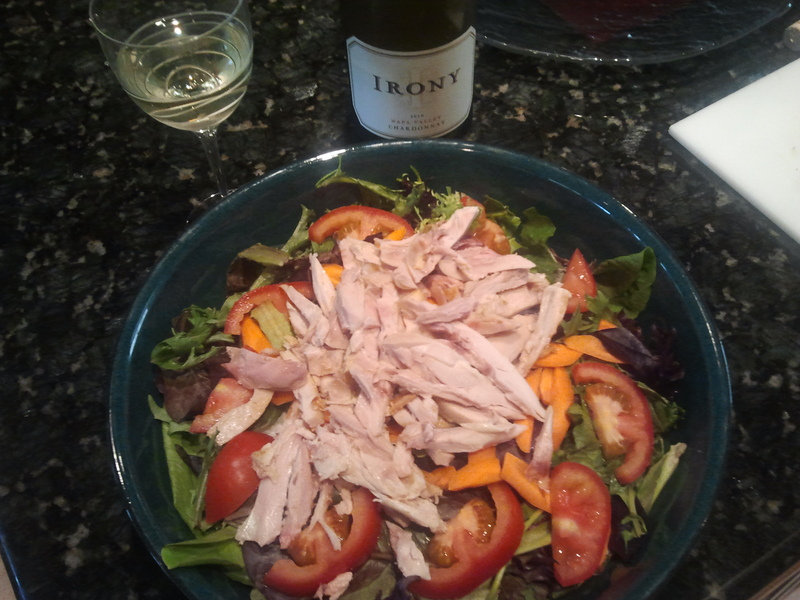 Grab a loaf of bread, a nice Chardonnay and you have dinner. Yes, the picture was taken with a cell phone. Super simple like this recipe. In a shallow dish, combine the cheese with the bread crumbs. Coat the fish with butter and dredge in the cheese/bread crumb mixture. Place on a foil-lined baking sheet and bake until the fish is opaque in the thickest part, 15 to 17 minutes. Serve the fish with the lemon wedges. I really don’t have a clue where this recipe came from. James Beard has a recipe for chicken that is similar and when I looked up my Parmesan-Crusted Tilapia recipe it was different than what I’ve presented here. It was a Rachel Ray recipe. I had to change it.